Sheriff Keith O. Wood with Santa Claus at Bob Evans. Pam Patterson giving out gift bags to the children provided by the Rutland Volunteer Fire Department. Sheriff Keith O. Wood receiving funds from the Farmers Bank in Tupper Plains. Employees raised those funds for Shop with a Cop during their bake sale. Deputy Michael Hupp helping a young boy find the perfect gift. Deputy Brandy King helping a young girl choose a pillow. The participating officers with their cruisers. 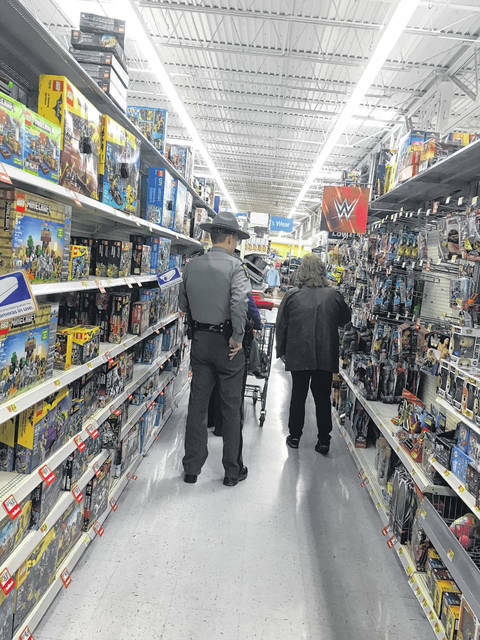 Ohio State Patrol Officer Shawn Cunningham helping a child choose an action figure. Wildlife Officer Chris Gilkey helping a young girl choose the perfect gift. MASON — Area children were recently immersed with Christmas delight provided by local law enforcement officers. It appears Santa doesn’t just live at the North Pole but has office space in the Meigs County Sheriff’s Office as well. 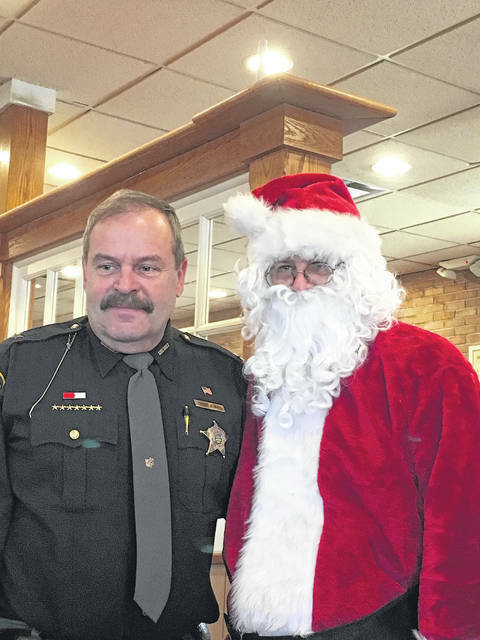 On Thursday morning, several officers and workers from local law enforcement agencies, workers from Meigs County Jobs and Family Services, and 30 children overtook a corner of Bob Evans restaurant in Mason to start Shop with a Cop with a warm breakfast and greetings from Santa Claus. Wood shared this is the fourth year the Meigs County Sheriff’s Office has taken part in the Shop with a Cop program. The Mason County Sheriff Office introduced the Meigs County Sheriff Office to the Shop with a Cop program in 2013. Wood expressed this year has had the highest number of children to be involved. 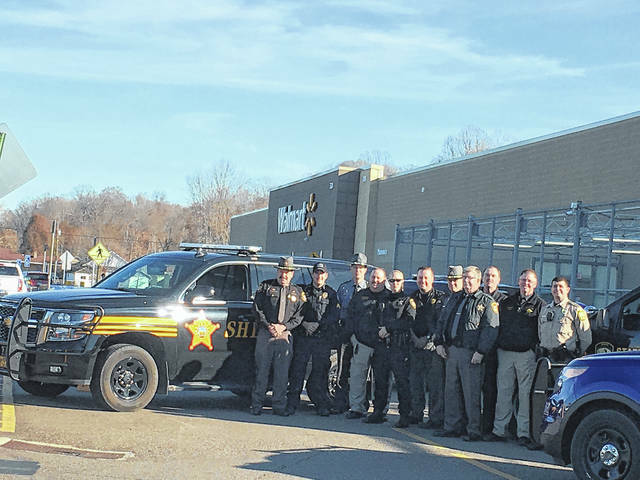 Also, Wood wanted to give officers from other agencies an opportunity to shop with the children and participating in the event were law enforcement personnel from the Meigs County Sheriff Office, Ohio State Highway Patrol, Racine Police Department, Syracuse Police Department, Middleport Police Department, and the Division of Wildlife. Wood said throughout the year the Meigs County Sheriff’s Office will receive names of children in need for the holiday season from Meigs County Jobs and Family Services. Wood added that local officers also share the names of children they come across while on duty. Wood and King shared how they and all of their fellow officers see some of these children during times of turmoil for their family. Wood said the children can be inclined to think of the officers as, “the bad guys,” but with this program all of the officers want to let the children see that officers are good people and are here to help. Following breakfast, everyone participating in the program loaded up and headed to Wal-Mart to shop for Christmas gifts and winter clothing items for the kids. Wood explained that the Meigs County Sheriff Office has fundraising projects throughout the year to earn money for the end of the year program. He said they set a goal to raise at least $5,000 this year. Wood shared that this year they had their annual, “No Shave November,” and, “Ugly Christmas Sweater Basket Games,” along with a benefit softball tournament held by the Pomeroy Youth League and a bake sale held at the Tuppers Plains Farmers Bank. The funds for the program come through the, “Loyalty is Forever,” account at both Farmers Bank locations in Pomeroy. Wood expressed how supportive Tina Richards and Lori Miller from Farmers Bank are to his department. Wood shared he encourages his community to support this program. He said he would like to reach $10,000 for next year and possibly change their location for breakfast. Wood said people can support this program at anytime of the year if they go to either Farmers Bank locations in Pomeroy and donate to the, “Loyalty is Forever,” account. https://www.mydailytribune.com/wp-content/uploads/sites/42/2017/12/web1_ShopCop.jpgSheriff Keith O. Wood with Santa Claus at Bob Evans. 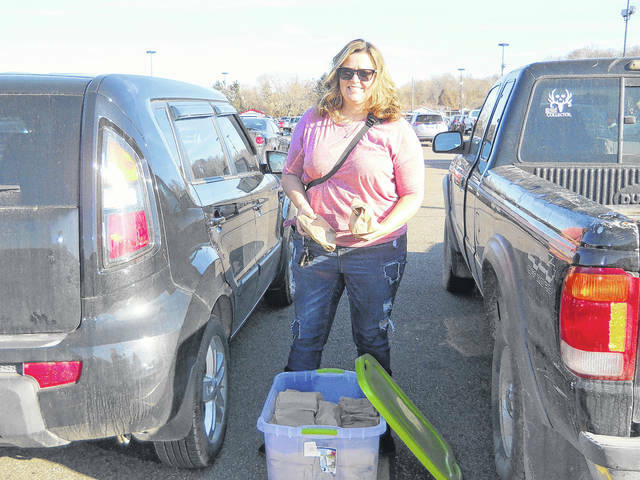 https://www.mydailytribune.com/wp-content/uploads/sites/42/2017/12/web1_ShopCop1.jpgPam Patterson giving out gift bags to the children provided by the Rutland Volunteer Fire Department. https://www.mydailytribune.com/wp-content/uploads/sites/42/2017/12/web1_ShopCop10.jpgSheriff Keith O. Wood receiving funds from the Farmers Bank in Tupper Plains. 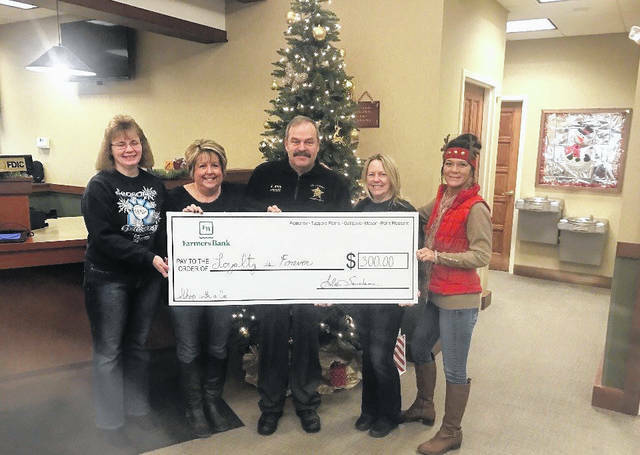 Employees raised those funds for Shop with a Cop during their bake sale. 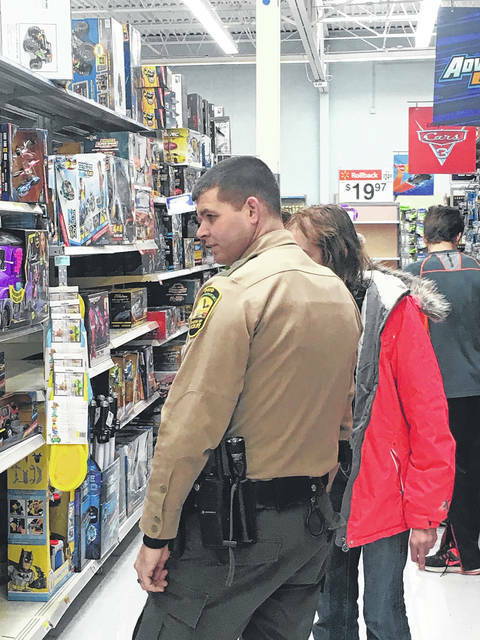 https://www.mydailytribune.com/wp-content/uploads/sites/42/2017/12/web1_ShopCop11.jpgDeputy Michael Hupp helping a young boy find the perfect gift. 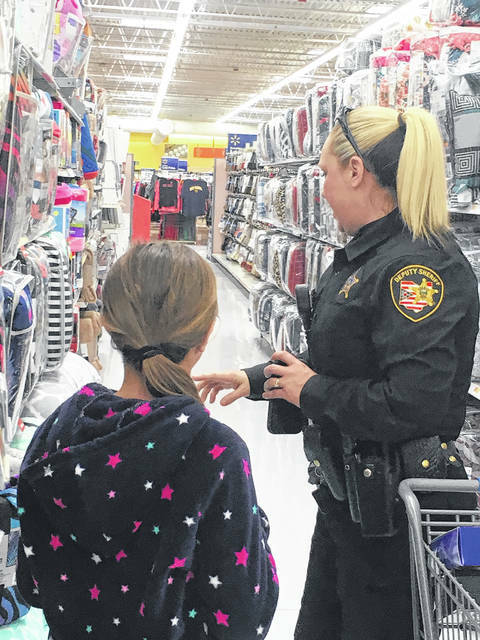 https://www.mydailytribune.com/wp-content/uploads/sites/42/2017/12/web1_ShopCop3-1-.jpgDeputy Brandy King helping a young girl choose a pillow. https://www.mydailytribune.com/wp-content/uploads/sites/42/2017/12/web1_ShopCop3-2-.jpgThe participating officers with their cruisers. 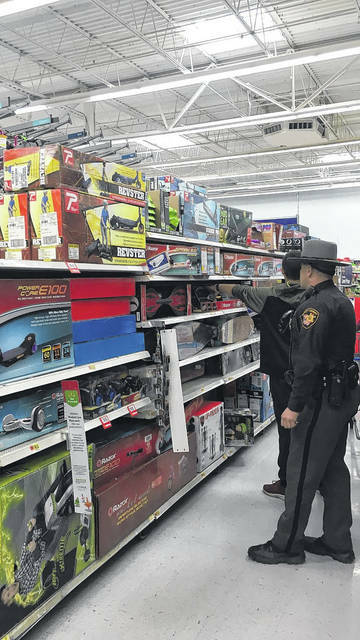 https://www.mydailytribune.com/wp-content/uploads/sites/42/2017/12/web1_ShopCop6.jpgOhio State Patrol Officer Shawn Cunningham helping a child choose an action figure. https://www.mydailytribune.com/wp-content/uploads/sites/42/2017/12/web1_ShopCop7.jpgWildlife Officer Chris Gilkey helping a young girl choose the perfect gift.